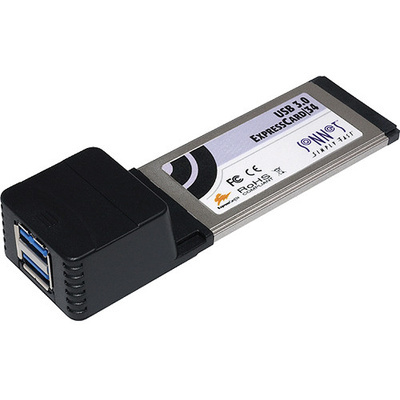 Product #15694 | SKU USB3-2PM-E34 | 0.0 (no ratings yet) Thanks for your rating! The 2-Port SuperSpeed USB 3.0 PCI ExpressCard/34 Adapter from Sonnet adds two SuperSpeed USB 3.0 ports to any computer with an ExpressCard/34 slot, such as an older MacBook Pro or PC notebook computer. Harness the full potential of the latest hard drives and SSDs with the USB 3.0 interface, which supports data transfer rates of up to 5 Gbps. In addition, this adapter supports hot-swappable storage connections. Mac OS X driver for this card does not support non-storage devices, iPods, iPhones, USB 3.0 hubs, and bus-powered 2.5" drives & SSDs. USB 3.0 cables are required to support USB 3.0 transfer speeds. The values mentioned are theoretical interface data transfer speeds. The real world transfer speed as per Sonnet's internal test is approximately 200 MB/s.